Luggage holds vary in size and shape from helicopter to helicopter but one similarity all helicopters have, is the limited amount of space available for passenger luggage. It is in our best interests and yours that we supply you with as much detail about the luggage capacities of the particular helicopter that you have decided to travel in. This for one is to save you money on excess luggage carriage and secondly; so that we provide the best service to our clients. We don't want you to spend more money than is needed plus we understand how nice it is for your luggage to arrive at the same time as you - no likes to wait for their luggage especially when it could take 2, 3 or more hours to arrive after you have. As a clear guideline - each passenger should not be carrying more than ONE MEDIUM SIZED SPORTS HOLDALL. Please note the type of bag - 'sports holdall', helicopters do not cater for hard cases/bags. If you wish for your luggage to be transported in the helicopter with you, you will need to use soft bags that can be squashed into the small luggage compartments. If you have excess luggage alternative arrangements will need to be organised for its transportation to and from resort. For ski transfers; helicopter airport transfers to and from ski resorts where you will be travelling with what could be considered quite a substantial amount of luggage the best helicopter to perform the mission is the Eurocopter AS350. Apart from it being the most cost effective or least expensive helicopter it is also the helicopter that has the best luggage capacity especially with its utility basket for the carriage of skis. These reasons alone could be why the Eurocopter AS350 is the most widely used helicopter across the French Alps. 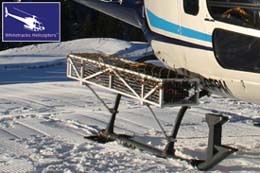 The Eurocopter AS350 and Eurocopter AS355 are the only helicopters that come with the very useful extra of a utility basket. Utilitly baskets come into there own if you or anyone within you party have skis! A few other helicopters will allow the carriage of skis but only skis of length 1m50 which, even by todays parabolic ski length is very short! Many helicopters due to their luxurious interiors will not allow the carriage of skis! If you or any of the party have skis please inform us within your enquiry. 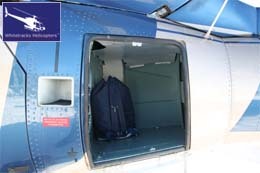 The two Side Luggage holds of the Eurocopter AS350 vary in size which is due to the right side luggage hold containing the helicopter batteries. Left Side Hold: Length 120cm X Height 70cm X Depth 40cm at one end decreasing to 20cm in depth at the other end. Right side hold: Length 80cm again decreasing in size from one end to the other. Although larger than the side luggage holds the rear luggage hold has a much smaller entrance. This is one of the reasons you need to use soft sports hodalls - bags that can be squashed and oushed through irregular shapes! The door leading to the rear luggage hold is 44cm X 55cm – depth of the hold is 90cm X Length 80cm X Height 60 cm. 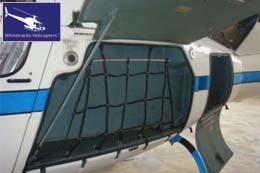 Utility basket (cage or pod) sizes vary from helicopter to helicopter. The dimensions listed are for the largest type of utility basket available! Utility Basket (cage or pod) Length 240cm X Width 59cm X Depth 49cm. Please note the majority of utility baskets on the helicopters are usually smaller than the one listed. 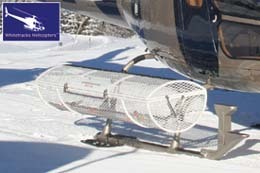 The Utility Basket is used for the carriage of skis and snowboards. The basket can also be used to carry luggage during airport transfers.